Handpainted series of 8 works in 12 different colours. Barcelona Forms is an important series because it forecasts the future direction of my practice, in particular, themes around the idea of readymade abstraction. These isolated, floating forms are appropriated from the real world, collected on walks and trips around Barcelona. They relate directly to the city itself and are a record of my personal experience within the city, reflecting my interests at that time. These were produced during an Australia Council residency in Barcelona over summer 1998. 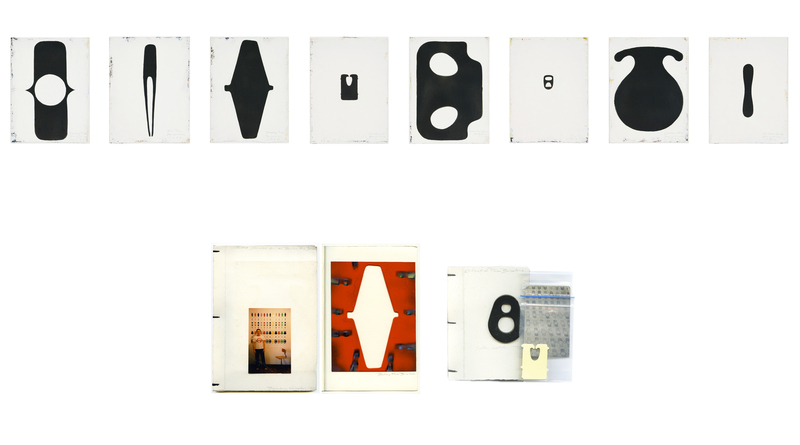 In the image you can see my small diary with all the found reference forms collected during the residency. I have also included my stencils used to make the work...layered in 12 different coloured coats of paint!